If you’re a violist, you have exemplary taste in instruments and music! Don’t let jealous violinists and dumb viola jokes get you down. Be proud of your uniqueness and the lovely warm timbre of your playing! This “Viola Pride” design makes wonderful gifts for any viola player you might know, whether he or she is an aspiring student, a viola teacher or a professional performer. Buy this design now on any t-shirt, hoodie, tote bag, mug or other quality apparel or giftware item, exclusively from Bratsche’s Viola Bazaar! 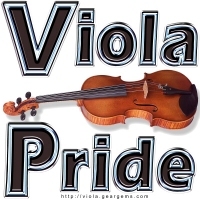 Also be sure to check out our other Viola PRIDE design!